« The Fansub Viewer’s Hypocritical Oath? It’s funny how ones views can change so drastically over time by more experience with things. One year I’m excited by “character episodes”. A “character episode” here refers to an episode whose sole purpose is to showcase a character. To reveal information about that character. To parade that character around, and show what they are like. To show how the character reacts, and what’s going on in their own personal life. The main character gets so many episodes about his quest to defeat the powerful villain, or her pinings for that cute guy from class. Let’s see some time for the side-characters! And a year later, I find myself preferring not to have character episodes. The problem with an incorrectly handled character episode is the same as an “infodump” in a novel. You’re pouring a whole bucket of information about a character all at once, rather than having it come out one drop at a time. Even worse, if you don’t make use of all that information within the story, if they don’t in some way impact the plot in a meaningful way, then it’s useless to the reader (the viewer) to read (watch) the events for that individual character. The series which got me entranced by character episodes was Seven of Seven. Each of Nana’s other six personalities gets an episode. I don’t recall if Nana’s best friend, Hitomi, gets an episode, but the trio each get an episode. That’s nine episodes right there out of a 25 episode series (not counting the nonsense bonus episode). That’s 36% of the series. Granted, 36% doesn’t seem like a lot, and it leaves 64% for “everything else”, but that’s not the true danger of character episodes. What are these character episode candidates doing in the other 64%? They have 4% of the series all of their own, and 32% is reserved for the other characters. After Nanacchi learns about cooking, what happens with her, other than being cheerful every moment (which I absolutely adore)? After Nanapon hypnotises half the town, what role does she have outside of minor acts of fortune telling? What do we really know about Ko-chan by the end of the series, other than a passing bit about what kind of profession she works at getting into? For what Seven of Seven is, the character episodes worked well enough. However, I can’t help but wonder, what would the series have been like without the character episodes? Work on the plot a little more, stretch things out a bit, and give characters more individual roles to tell us who they are. Putting more minor focus on non-main characters allows character building in a manner that works the same as foreshadowing. 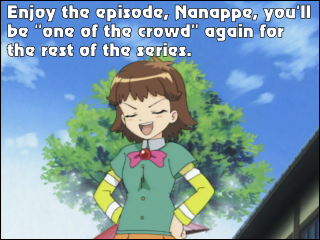 If Ko-chan is going to be impressed by Nana’s hard work in a later episode, show us that hard work impress her. Otherwise, she’s simply a slacker like her friends who doesn’t believe Nana has what it takes, only to learn otherwise. Nana joined the “fast track” class, barely making it in to this class for excelling students. She’s been keeping up with the class, enough to not be dropped from it completely. This Ko-chan will mock, but when it comes to Ko-chan’s cultural festival, Nana’s hard work shines through? Back to Nanacchi, she learns a lesson about cooking. There was no indication before her episode about her lack of cooking ability, and I think her gained cooking skills only had only appearance in a later episode. Outside of this, she was simply another character. What were her efforts worth if they were for nothing in the eyes of the overall story? Obviously she got something out of the experience, but was that something not lost by the next episode and never picked up again? I may be coming down hard on Seven of Seven, but I still love the series. It’s fine the way it is, and it may not have benefitted from trying to give the characters a larger number of minor character building roles. It’s not exactly easy when the cast is seven Nana’s, their best friend, three bullies, one grandpa, two teachers, one love interest, one friend of said love interest, etc… Considering at least 12 as “main” characters (the Nanas, Hitomi, the trio, and Kamichika), there’s a lot to fit in to 25 episodes. Following a smaller cast is Petite Princess Yucie. Take five princess candidates, five stewards, five fathers, a mysterious man named Arc, and the queen, and you have what appears to be a large cast. Larger than even Seven of Seven‘s? Maybe. But Petite Princess Yucie handles the characters in different ways. There are still character episodes, to be sure, but they’re not the same. To cut the cast down a little, three of the fathers have minor roles, and of the remaining two, one has a small part. With the exception of Gunbard, the fathers only exist to establish who the five princess candidates were before we entered their lives as a viewer. Elmina may seem prudish and uptight, and even a bit cruel, but once you see her father, you can say, “Oh! So that‘s why she’s like that!” Her father builds her character. Glenda’s father isn’t exactly a mirror into who Glenda is, but rather who she isn’t. Her inspiration, her mother, doesn’t even need to appear in the series. Glenda’s mentions and adoration of her mother’s greatness are all we need to learn more about Glenda as a person. Even Beth’s father tells more about who Beth is by showing us what she’s been going through, what she’s been trying to do to help her father. We don’t need to get to know him as well as we do Elmina’s father, as his suffering is what shapes Beth’s character. There are five fathers, each presented under differing circumstances, each reflecting the selves of their daughters in their own ways. Next, there are the stewards. They do get an episode of their own, one for the five of them, but it isn’t there as a way of building upon the characters as individuals. By watching the interactions of Cube, Gaga, and Chawoo, Belbel is able to learn something about the candidates they steward for. This introduces an open eagerness by Belbel for Beth to befriend the other candidates. Outside of this episode, the stewards are given small roles and well written lines to give them life and character. Cube shows up to help Yucie when he’s asked to. Or even when he’s not. When Yucie is taking a part-time job at a magic shop, Cube visits hoping he can get an employee discount through her. Gaga puts forth an equal dedication and concern for Glenda, but comes with the experience of age as well as a lack of esteem for Cube, the demon-turned-traitor. Chawoo is the sarcastic, good-natured, joking steward whose presence provides a contrast to Cocoloo’s shy, quiet nature. If there’s an opportunity for him to make a joke, he will. And of course, Belbel needs only say things in that adorable way she does. These stewards are not main characters, but they have enough characterization that they feel as if they are at times. The main characters wouldn’t feel whole without this supporting cast behind them. The stewards, like the fathers, shape who the girls are, both as people and as princess candidates. Setting aside the episode focusing on the stewards, and the episode focusing on Gunbard’s past, the stewards get enough time and lines to establish them as believable characters, and the fathers get enough time to further establish who their daughters are as characters. Out of 26 episodes, this leaves 24 episodes free for other things. And what’s that extra time filled with? Character episodes! But, in a good way. The general premise of Petite Princess Yucie lends to character episodes nicely. The girls get jobs. The girls collect flowers from each of the worlds. 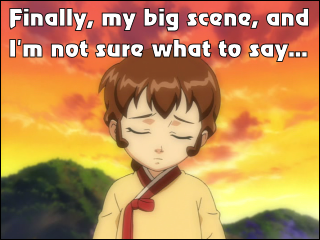 The latter gives us Glenda’s melodramatic-filled scenes about how she must become an adult to protect the demon world. The former gives us a look into Glenda’s lovey-dovey side, a part of her she keeps hidden. The latter shows us Elmina’s struggles to be perfect in her father’s eyes, but at the same time the other girls are there for her all the way. Elmina might be trying to stand out on her own, but when she can’t do it, she realizes she’s one of the team, and her friends are by her side. The former shows Elmina in a more humbled position, as she sees another man and his daughter in a position which could one day reflect her and her own father. The former shows the Cocoloo whom even she isn’t sure exists within her. The latter, well, she actually doesn’t have much of a presence even in her home world episode, come to think of it… It was more a Beth episode, really. On that note, Cocoloo does get a number of interactions with Beth to make up for it. And as for Beth, she enters a bit late in the game, but her flower episode gives a combination of something for her to think about concerning the other candidates, and a fantastic decision on her part when asked to join them. For the most part, these character episodes give a fair to decent amount of time to the other characters. Yucie may not do much as a cat, but Cube and Glenda’s father have a good laugh. Elmina isn’t alone on her way through the triathlon. Cocoloo and Beth play parts in both of their flower episodes, as well as the others further establishing who they are. Glenda’s quest to dig underground for the flower while the other three risked their lives to climb for it, this spoke a lot more to me about who they are than did the actions of the Nanas when they clashed over Ha-chan’s future in Seven of Seven. If side characters are used properly throughout, they don’t need individual episodes to tell who they are. 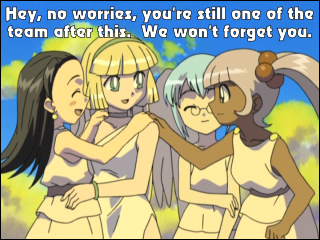 Petite Princess Yucie takes this to heart, but it can be applied to the main characters as well. I wouldn’t change Petite Princess Yucie‘s use of the flower quests as character episodes one bit, as they specifically impact the characters involved as well as the plot. Still, a series can be put together in a way where even the main characters can do without their own individual episodes. This is the series which caused me to realize, “Hey, we don’t need character episodes if the characters are properly built up evenly throughout.” Early on in Janggeum’s Dream, I took a liking to the character Yeonsaeng, and wondered what manner of episode she’d have for herself. As the 26 episode series progressed, I realized there wasn’t any room for character episodes. There was too much focus on the plot, and moving it along. There were naturally side-quests and deviations from the plot, as things came up for the characters, but these episodes kept their focus on Janggeum and her dream of becoming a cook able to prepare dishes which make people happy. It’s never explained why Yeong-ro and Yeonsaeng became apprentice court ladies. They don’t get their own episodes about it. Even Geum-yeong fails to get an episode devoted to her. And yet, they get along just fine as main characters. Geum-yeong has her time when her aunt steals Granny Pot’s recipe for Geum-yeong to use. Yeonsaeng has her moments when she must be there for Janggeum as a partner. Yeong-ro, she has her rivalries with Yeonsaeng, and her eyes set on Suro. She has her loyalty to Geum-yeong, and her dissatisfaction with Janggeum. We learn Yeonsaeng cannot swim, and we learn she is afraid of heights. We learn Yeong-ro doesn’t like bugs. Neither of these affects the plot in a truly significant way (as Yeong-ro’s reaction the bees would have no doubt been the same even if she didn’t dislike bugs). And just as these do not affect the plot, they are neither given more than passing remarks intended to tell us more about who these characters are. They establish who the characters are in a way which is used consistently throughout the series. In a later episode, after Janggeum gets in trouble, Court Lady Han cannot be there to help her. Just the opposite, Lady Han has to be strict with Janggeum. She has to verbally punish Janggeum for what Janggeum has done. Lady Han’s pain is the viewer’s pain not because we recently had a whole episode about Lady Han (we never had such an episode), but because we’ve seen everything she’s been through with Janggeum. Flashbacks from earlier episodes are used as a reminder of this, going back to when Lady Han first helped Janggeum learn the basics in Janggeum’s new life as an apprentice court lady. No whole episode for Lady Han was needed prior for this scene to have an impact, nor did this event call for an episode devoted to her and how she struggled with the situation. Instead, the episode added to the characters of Janggeum, Yeonsaeng, Changi, Jeong-Ho, Suro, and even Jungjong, as well as Lady Han, not to mention Yeong-ro and others. The actions of a character tell us who that character is as an individual. It’s the character interactions which build who characters are in relation to another another. The less main characters there are, the more these can be built up. The more minor characters there are (on varying levels of “minor”), there are different opportunities available for establishing who the main characters are. By carefully letting out information about a character, and keeping their actions consistent with what’s been learned about the character, a series can play out without a single “character episode”. A series can play out without infodumping a character’s past, or forcing them to improve for the future, all said and done and forgotten in the span of a single episode. One year I’m looking for the next Seven of Seven, and the following year I’m looking for another Janggeum’s Dream, in terms of character development. I wonder what upcoming years will bring for me.